Product prices and availability are accurate as of 2019-04-11 10:27:47 EDT and are subject to change. Any price and availability information displayed on http://www.amazon.com/ at the time of purchase will apply to the purchase of this product. The USS Gerald R. Ford (CVN-78) is the lead ship of a new class of US Navy supercarriers, and is well equipped to bring a swift and decisive measure of force to any scenario. Named after Gerald Rudolph Ford Jr., the former President of the United States, the ship and her crew uphold the same honor and integrity that was a hallmark of President Ford's life. After serving as a naval officer in World War II, attaining the rank of Lieutenant Commander, Ford was elected to the United States Congress in 1949 and held his seat for 25 years. His tenure was marked by Ford's modesty and integrity in legislative negotiations. In 1973, when President Richard Nixon had to choose a replacement for disgraced Vice President Spiro Agnew, the overwhelming consensus on the hill was that Ford was man for the job. After President Nixon resigned, President Gerald Ford took the oath of office and became the 38th President of the United States. The USS Gerald R. Ford has a displacement of approximately 112,00 tons and carries a compliment of over 4,660 personnel. Stretching over 1,106 feet in length and with a 256 foot beam, it is one of the largest carriers ever made. The USS Gerald R. Ford, equipped with a modern defense system and carrying more than 75 aircraft, is well prepared for any mission across the globe. 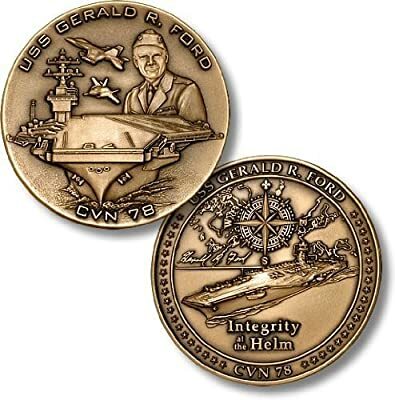 Minted in the USA from solid bronze, using special deep-relief coining dies, and hand-finished with an antique patina for exceptional quality and detail, this coin pays tribute to the USS Gerald R. Ford and her crew. The obverse features a frontal view of the supercarrier with a portrait of Gerald Ford looking on and two F-18 Super Hornets flying overhead. The reverse displays the crest of the USS Gerald R. Ford.